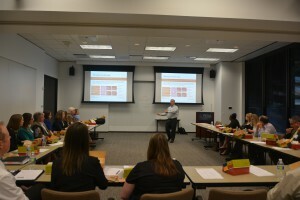 With this statement, Steve Lancaster, Director of Human Capital at PwC opened PESA’S HR Roundtable on the Employee Value Proposition, March 31. “Organizations in ever-increasing numbers are striving to create a work experience that motivates employees, aligns resources to business goals, and measures the impact of effort,” said Lancaster, emphasizing that employee engagement is key to retaining talent and increasing trust in organizations. Lancaster explained that over the past two decades, employee engagement has served as a measure of work experience and consistently been shown to be related to increased employee retention, workplace safety, performance, quality, customer satisfaction, sales results, and financial growth. In contrast, advocates of engagement have found that focusing on creating an engaging work environment has provided value and return. Some organizations become stuck, content that the given level of engagement is enough, while others want to more fully realize their return on engagement, but are uncertain about how to take things to the next level. Attendants representing different companies from the oilfield equipment and service sectors shared their challenges and opportunities regarding recruiting, retention, and workforce development. Discussions around the generational gap impacting the industry were predominant amongst participants. “A new recruitment approach is required to effectively attract today’s and tomorrow’s talent, by tailoring to each generation’s needs,” emphasized Lancaster, adding that if companies want to maintain performance, understanding the critical differences between generations is vital. 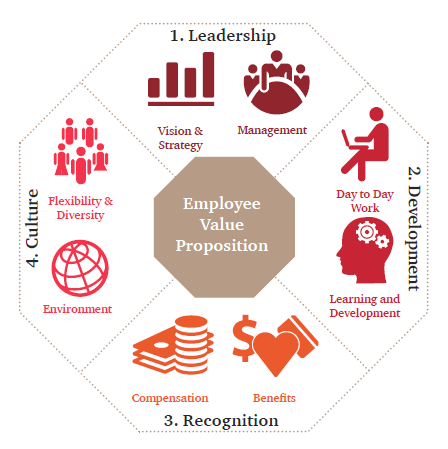 This image displays the four components of the Employee Value Proposition attributes. The first factor, Leadership, focuses its thoughts and energy in inspiring and directing, and also creating a cascade effect in the organization. The second element, Development, encompasses coaching and training that allows employees to continuously learn and grow personally and professionally. Recognition is the third aspect of EVP, which is the action that shows hands, minds, and hearts recognized and rewarded to motivate employees to do their best work. Finally, Culture, is translated as the shared perceptions and assumptions that drive organizational norms for how people interact and get work done. The most common obstacle was doing work for others that is not part of the job (selected by 33% of respondents). This was followed by being in meetings unnecessarily, and paperwork (24% and 23% of respondents, respectively). Only 7% indicated there were no obstacles to their work. The seminar approached Engagement as a very powerful tool that can enable organizations to align employees and drive business outcomes. “Organizations can build on foundations and make the experience truly distinctive. They should define and mitigate obstacles that can impede progress, and business outcomes should be measurable so that the impact can be shown,” explained Lancaster, concluding that distinction, innovation, and other positive outcomes are a result of the creation of a work experience that touches employees on each of these vital components.